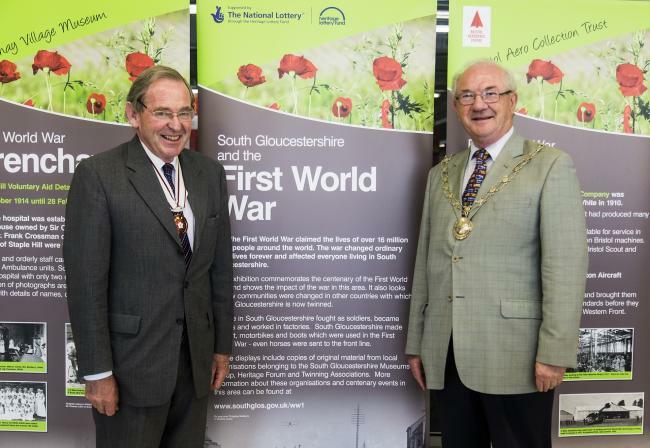 The ‘South Gloucestershire and the First World War’ project launched on Wednesday 23 July, thanks to a grant of £60,000 under the Heritage Lottery Fund’s (HLF) First World War: then and now programme. The First World War Centenary project will see South Gloucestershire Council working with local community heritage organisations to improve public engagement with the anniversary. We are coordinating a range of activities to help communities access and interpret the First World War resources held by these local organisations. There will also be a website to signpost exhibitions and events. Pictured (l to r) are Vice Lord Lieutenant of Gloucestershire Robert Bernays OBE and Chairman of South Gloucestershire Council Cllr Howard Gawler. To mark the declaration of war in 1914, the project has created a travelling exhibition which shows the impact of the war in this area and also how communities were changed in other countries with which South Gloucestershire is now twinned. It reveals that people in South Gloucestershire fought as soldiers, became nurses and worked in factories, and that local businesses made aircraft, motorbikes and boots which were used in the First World War. The exhibition was launched on Wednesday 23 July at the Tesco supermarket in Yate. Chairman of South Gloucestershire Council Cllr Howard Gawler presented the opening address, Deputy Store Manager Steve Baker spoke on Tesco’s behalf and Vice Lord Lieutenant of Gloucestershire Robert Bernays OBE also attended and gave a speech. The exhibition will tour public venues in South Gloucestershire to engage directly with local communities. The official opening also featured poetry readings which included recitals of ‘Aftermath’ by Siegfried Sassoon and the ‘Hawkesbury Hospital’ by Sergeant E Rex, along with a performance of period songs by local singer Rachael Hunt. The exhibition will remain at the Tesco supermarket in Yate for four weeks before moving on to the Tesco store in Bradley Stoke for a further four weeks, after which it is available for other venues in the area.